Sadly sourcing art can be a very expensive exercise, even more so when you live in Dubai, as there aren't a million places to find affordable prints… Enter, stage left, Drawdeck! 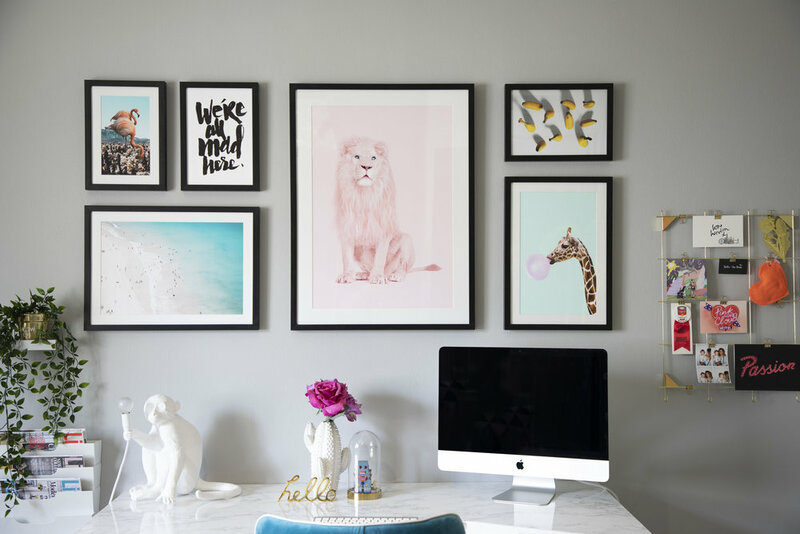 So when the team approached me to work on a collaboration together to not only create, custom-frame and install a gallery wall, it was a match made in heaven. We worked together for the past few weeks to create my dream wall gallery in my own pad as well as my own curated virtual gallery on their site. Drawdeck curate the work of a wide selection of artists to offer the best in quality and variety and each sale directly supports the artist behind the design. On their website you can buy not just prints but have them custom framed - each frame is handmade in their workshop with British wood and a glass front and delivered to your door within a week. I have used them so many times for projects, and they've never disappointed. I am told they're currently working with a handyman service to introduce a fixed fee installation on delivery, later this summer - it will literally mean artwork will be hanging on your wall in just a few clicks. I have picked 20 of my absolutely favourite artworks from their collection, 6 of which are now displayed in my home office. And above is the result. To say I am totally in love with my new space is an understatement! I have listed all the prints and artists featured in my wall gallery. To celebrate our collaboration, Drawdeck are offering Stella + the Stars readers an exclusive 15% off their entire collection by using the code STELLA15 at checkout. This offer is available until 30 June 2018. Click here to discover the collection curated by Stella + the Stars on Drawdeck's website. Disclaimer: This post was written in collaboration with Drawdeck (a girl's gotta eat), but as always, all opinions, and sarcasms are my own. I only work with brands I genuinely love and would buy products from anyways. If you’re a brand interested in working with Stella + The Stars, please contact me on emilie@stellaandthestars.net.